Due to the overwhelming popularity of 5 Things Other People Like that I Don't, I decided to write part 2: 5 OTHER Things Other People Like that I Don't. Let's assume I'm going to drink pop in the first place. My first choice would NOT be diet coke. Gross factor x 10. I am a Pepsi girl all the way unless it's cherry coke, which is pretty much like having a party in my mouth. Why is no one obsessed with Diet Pepsi? Sorry not sorry on this one. Call me a prude and hate me forever (or don't, cuz that's mean), but I cannot stand the F word. I know this sounds made up, but when I hear the F word, my ears hurt. At my previous workplace, one of the office managers used the F word a lot, and it bothered me. Not professional. I'm not going to stop being your friend or punch you in the face if you curse around me, but we'll just have to agree to disagree on the necessity of using the F word. It's a funny show, but I'm not obsessed with it like everyone else I know seems to be. I watched season 1, so I know what's up. Maybe I gave up too soon? All I know is that unless I hear an argument more compelling than, "But it's really good," I'll stick with my Friends reruns, thankyouverymuch. I have never dyed my hair, and I don't plan on it. Dirty blonde I am, and dirty blonde I shall stay until I'm old and gray. I don't judge people who dye their hair. I don't think, You're a freak or anything like that. Actually, I admire people who are confident enough to rock blue hair with pink highlights. I just personally don't think it's my thing. I'd rather spend my money on race registrations and cupcakes. Plus it's just way too much work keeping up with hair color. I'd have roots a mile long, and nobody wants to see that. What is this about? Who started this? I don't understand. Am I missing something? What's something else other people like that you don't? I wouldn't drink or eat diet or sugarless anything. Gross. And I trust sugar and even high fructose corn syrup more than I trust some of the other stuff they use to replace it! I also do not like the F-word or people who think that it makes them cool and easy to relate to because they swear constantly. To me, that's a cop out. I can think of more creative words to express my feelings, and definitely not curse words related to degrading women. Some people drink diet soda when they drink soda as they have diabetes and the regular would have to much sugar in it! I agree with every single one of these. Lol. How I Met Your Mother is what I watch when I'm tired from school and just need to let my brain deflate for a little while. Friends is better, I've recently discovered. As for coloring hair, I've never understood that. Why change your natural hair color? The only ugly hair colors I've ever seen are the unnatural shades of what were natural hair colors. The reds that are too red, that bleached blonde-white, and the jet-black that only certain nationalities have (and therefore it looks strange on anyone else). Major pet peeve, there. :/ Fun post, though! I may do something similar on my blog. Sorry about that rant. Last year in Biology I sat behind an Indian girl with gorgeous black hair (I was jealous) and a girl who was a natural blonde, but dyed her hair that color. It irritated me all semester. Lol. I also cannot get into the one nail a different color thing, I think it looks like I was at the store and wanted to buy some new polish and tried it out first! Totally agree with you on How I Met Your Mother. I do NOT understand why so many of my friends like it! A couple guys have told me that they see Ted as relatable and similar to themselves...which doesn't seem like a compliment in my book. HA! I love your list. I don't watch HIMYM and don't understand the obsession with it. I don't drink Pepsi if a place is a Pepsi product and they don't have sweet tea then I'll just order water. I only paint my fingers different colors when one gets chipped and I'm too lazy to repaint them all a different color. 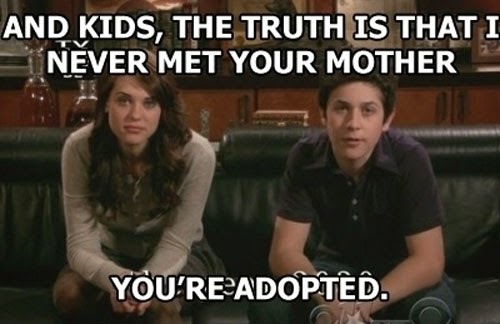 I really like HIMYM, but I'm not one of those people who can't understand why someone doesn't like it. I can't stand Seinfeld and it's supposed to be the BEST show ever. So, I understand. 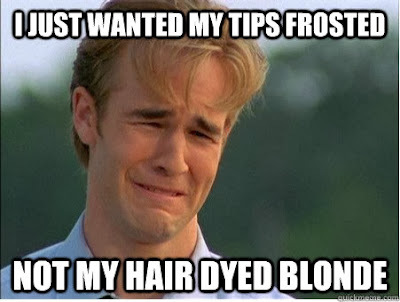 Also, if I had such a pretty natural color (seriously, love your hair) I wouldn't dye it either. Pepsi Max! I never drink soda, and I always hated diet. I just didn't get it. But Chad got me hooked on Pepsi Max for awhile. I have heard people say they just like the taste of diet better than regular, and thought that was silly, but Pepsi Max (which still has no calories) really does taste good and has caffeine "out da frame! "<<<it makes me say stuff like that! Completely with you on the ring finger nail. It just looks weird... NOT cool! Okay, I'm going to have to agree to disagree on like all of these issues. 1. Soda is disgusting. No matter what brand or flavor. 2. The f-word doesn't really bother me if it's used sparingly in books and movies and not to excess in real life. When clever people say the f-word, it says to me that they feel strongly about the subject enough to use vulgar language. I love passionate people. 3. HIMYM is way better than friends because the writing is more clever and the gags and inside jokes run way longer, and the acting is way better. The flashback devices are genius, and it's endlessly quotable. It's friends for the 21st century. Another TV series that similar to but better than friends is Happy Endings, even though it was canceled. Yes, something that only ran two seasons is better than friends. I feel pretty strongly about this. 4. I am a natural strawberry blonde, but I can and have pulled off brunette and really like my hair that color too. The only reason I don't is because it's expensive and hard on my hair. 5. I really don't give a crap about the statement nail. It doesn't bother me one way or the other. What else do you hate that I like? This is fun. Ha! Callie, I know this is you ;) I did not know you hated Friends so much! Terrible acting? FALSE. I feel strongly about this as well. Also, I liked you as a brunette. But it IS expensive, which is exactly why I don't like it. Did you see the first installment of this post? http://www.theladyokieblog.com/2013/12/5-things-other-people-like-that-i-dont.html Let me know what else we disagree about! Hysterical! I have never ever ever liked Diet Coke. Yuck! I am a Coke girl though except for Cherry Pepsi (haha!). I do however like to paint my one finger nail a different color than the rest of the them, sometimes I am really cool and paint the last two. I like to play with colors and I have so many that I like to get good use out of the colors I have. I'm definitely on the diet coke bandwagon and my hair looks so drab naturally. If I had a nice natural color, I would definitely not dye my hair. I keep considering just letting it be blah to save money as it is. Ha! As of this comment, my ring fingers are purple while all my other nails are red, and I dyed my hair for fun last week. But I am totally with you on Diet Coke! Coloring my hair has become a "non-negotiable" budget item! Not ready to embrace the gray yet. The rest of your list I'll agree with, very funny post.. Sarah wants to add some red to her hair. I love How I Met Your Mother. The first few seasons are great, but then it starts to get cheesy. I'll follow to the end because I'm curious, even though it stinks a bit lately. I'll always love those first few seasons though. 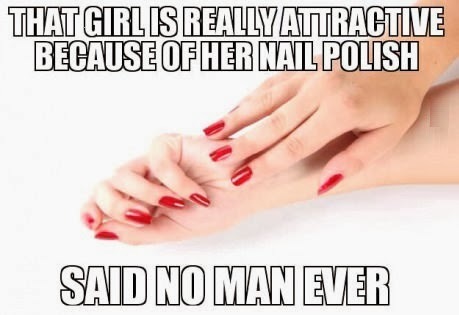 I don't get the nail polish thing, but I don't really do nail polish at all. Toes only. i feel you on diet coke, how i met your mother, dyed hair, and nail polish thing. Hahaha I agree with all of these! Well, I don't necessarily DISLIKE the power nail thing, but I don't do it for myself. 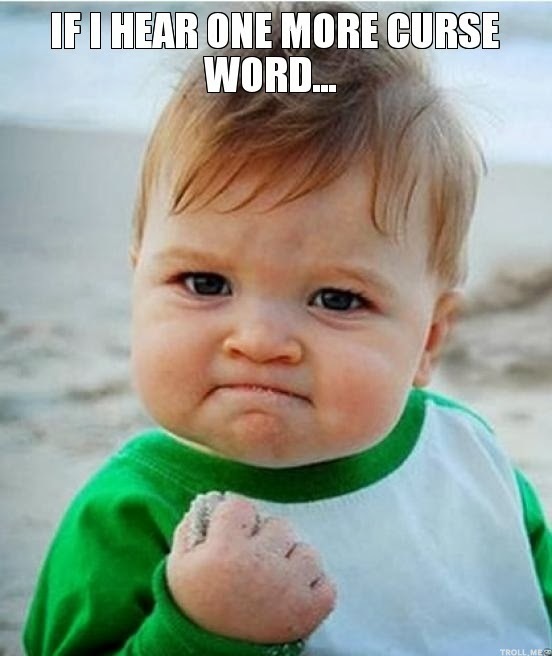 1000X yes on the f-word! Maya Angelou says one curses for three reasons: lack of vocabulary, laziness, and extreme frustration. Notice "sounding cool" didn't make the list. I don't understand the obsession with Starbucks, but I don't think I'm alone on that. Also, I hate strawberries. They look like noses covered in blackheads. ew. Haha! Oh my gosh. I love strawberries, but that IS gross. Haha, I laughed at the last one! I tried it once after I got engaged (I painted my ring finger gold and the rest a pink). I guess I thought that finger deserved extra attention at that time. It was definitely silly. Something I don't like...sweet tea. I don't HATE it. But I don't like it like most of my southern friends and family. I used to hate the ring nail painted but then it grew on me. Also, diet soda in general just grosses me out! If you are having soda I say go for it and chug the real deal =). I dyed my hair in high school, a beautiful 'auburn' color....until I spent some time in the sun! I had to go to work as a cashier in the only grocery store in town with orange hair. I dyed it back to brown (yes I am a mousey brown) and never touched it again....until the grey came. Now, I dye it, guess what color? Brown. Call me crazy, I know it's pretty wild, but I think, for now at least, it's better than grey. oh, wait, I like diet coke. infact, all I drink is diet soda, and yes mostly coke products. and I don't like cherry coke, Dr. Pepper, or orange soda of any kind. So on that, we can agree to disagree about diet coke. I totally agree with the diet coke one - it's disgusting has no flavour and basically just tastes like the bubbles of gas used to make it fizzy yuck! Also one random nail colour thing - what is with that? I barely have time to paint my nail as it is let alone faffing around with the one nail colour thing! I agree on the f-bomb thing, and swearing/cussing in general. I have younger kids, and have never wanted to have to worry about editing myself in front of them. I am more likely to say "Oh stink!" instead of you know, another s-word. :) I don't dye my hair, and don't plan to until I see gray. And I only paint my toes and not my fingers. Someone wrote about Happy Endings--loved that show! I miss it! TOTALLY agree about the Diet Coke!!! I really don't understand why people are SO obsessed with it. Coke? Blech. Diet Coke? Even more blech. Pop in general? Gagggg. Also I don't care for the F word either. I think that's probably the most offensive swear word--I can't stand most others but not that one. I swear way more than I should. I try not to use the f-word often just because.. I feel weird? But I just can't stop the others from flowing. But only around certain people. I try not to let them out around people I know don't like it. I don't dye my hair either because, like you said, I don't want to spend the money on it. And also, I just don't need *one more thing* to keep up with. my husband is obsessed with diet pepsi! :) & i couldn't agree with you more about the F word!! a lot of people i work with cuss a lot & it really isn't professional at all. so sometimes i feel more like i'm in high school than a corporate workplace! Oh dear.... Ok. I will say that HIMYM this season has been terrible, but the previous seasons are good. I'm with you though, I'm not obsessed. Now...Diet Coke and I are in a terrible relationship. We have a fountain at our nurse's stations, and I sweat to you that they put crack in there. I want to quit so bad, but I can't. It's always there, and I have NO self control. I also don't get using your ring finger as an accent nail. I'm too OCD for that. I'm with you all the way on the ring finger nail polish... BUT WHYYY?! It makes my OCD hurt. i've never died my hair a different color either! haha and I so loved all the rest of this too! We're either twins, or I'm a hater grump too. Diet coke is sicko. I've never watched that show, not interested. I don't dye my hair - something about trying DIY highlights in 7th grade that left me looking rather similar to a leopard. And I hardly paint my nails because someone has to do the dishes up in here and those chipped ends are just as nasty as the diet coke. The F word, my husbands go-to swear, makes me shiver and feel like I walked in on someone doing the dirty. Something about it being "the baddest word" is so ingrained in me. P.S. I did a happy jig when I saw your little icon in GFC. I feel like that's a little jar where I collect awesome bloggers, like flies to a neon light, and I scored the big one with you. Weird? Sorry. I confess that I love HIMYM, I enjoy painting one nail (not always the ring finger though - I mix it up 'cause I'm crazy like that), I do drink diet coke (but I don't mind diet Pepsi), and I occasionally highlight my hair (but always colors that will grow out pretty natural looking). I do think that use of the F word is really annoying and immature. Really, is that the only word in the universe to put the right emphasis on what is being described? I think not. One thing that Pinterest tells me that everyone loves that I don't like at all? Chalkboard EVERYTHING. Seriously, people? What's wrong with white boards or sharpies on paper? Or Post-Its? We invented these things so we wouldn't have to use chalk. My mom tried to get me to drink Diet Coke when I was diagnosed with diabetes, telling me that it tasted just as good, if not better than, regular Coke. I was like, "Nope, I'd rather get my leg amputated than drink Diet Coke for the rest of my life, thank you." I am so a Diet Coke addict but I limit it to one a day. If my hair wasn't gray I wouldn't dye it either. I'm old! I don't get the ring finger thing either, I tried it once and my OCD self had to take it off and make it right! I hate diet coke too! 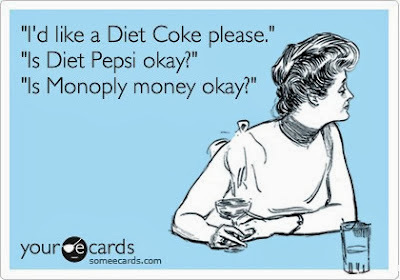 I LOVE coke zero...and diet pepsi, but HATE diet coke. all of these i can say me too! the first one because i don't like soda ever but that makes me weird. my husband loves diet coke so much and sometimes just gets water if they only have diet pepsi! hahah. OMG you have GOT to hate me!!?! Not a fan of painting my nails and stuff but I totally dyed my hair and........let's just say the F word slips when I'm realllllly frustrated. But! (there's a BUT!) I have changed the ugly F word into "frick" and "frizzle"...so it is a slow changing process :) Don't drink Diet Coke (I heard it was bad for you???) and I've NEVER watched a single episode from that TV series. You're a total kindred spirit. Hahahaha oh girl. Diet Coke is my jam, and I could probably reference every single episode of HIMYM. But that's okay. I lol'd reading this anyways, because I LOVE your honesty! Lol! The accent nail! I don't get it either. And I liked HIMYM, but I wouldn't try to convince anyone to watch it, because then you might get hooked like I did and be upset over how terrible the last season is.